Situated in Witcombe village, in an Area of Outstanding Natural Beauty, close to major road links, our comfortable cottages are well placed for visiting the many attractions of the Cotswolds, or simply taking it easy and enjoying yourselves! Both Amber and Jasmine Cottages can accommodate 4 people though Jasmine Cottage also has a double bed settee, so could accommodate up to 6 people - a total of 10 guests. Sleeping arrangements are flexible and you can choose between a super king size bed or twin beds. The main bedroom in Jasmine Cottage also has an en-suite shower room. All bathrooms have a wall fitted hairdryer and we provide towels, liquid soaps and shampoos - all help to ease those aching joints after a hard days sightseeing! We also have plenty of games and books for guests to use and enjoy. Beautifully situated traditional brick cottage, with outstanding unspoilt views over the Cotswold hills. Ideal base to explore the delights of nearby towns such as Cheltenham, Tewkesbury, Broadway and Stratford-upon-Avon. A rambler's heaven as the cottage sits on the Gloucestershire Way. In a peaceful setting on a beef and arable farm. The cottage itself has been equipped to a high standard. Two bedrooms upstairs shower room. One bedroom downstairs with en-suite. Very nice and well equipped kitchen and living room. Short breaks available to take advantage of nearby Prescott Hill Climb and Cheltenham Racecourse. Ample parking. Charming cottages each with garden, also luxurious self-contained wing of adjoining house suitable for disabled. Situated in a small hamlet on the Cotswold edge in good walking country. Convenient for Cheltenham, Winchcombe and Tewkesbury. Woolstone is a small, quiet rural village just a few houses and an ancient church on the side of the Cotswold Hills overlooking the Severn Valley. It is in the Area of Outstanding Natural Beauty with extensive views to the Forest of Dean, the Malvern Hills and Bredon Hill and on a clear day the Brecon Beacons. All around is good walking and riding country. A bijou, 16th Century cottage in one of Gloucestershire's most picturesque, medieval settings. Its unique location disguises its close proximity to the heart of the town and the full range of facilities and attractions available. Recently refurbished and retaining many original features, it offers both comfort and convenience in an "olde worlde" setting. With outstanding, uninterrupted views over the Severn Ham to the Malvern Hills. Attractive, high quality Cotswold stone cottages located on historic country estate mentioned in the Doomsday Book of 1086. Muir Cottage was converted from an 18th century barn to a design inspired by the Arts and Crafts Movement that established in the Cotswolds in the 19th century, resulting in an array of stone mullioned windows, leaded lights, exposed beams and period furnishings. The Bothy has been created from a 1700s Cotswold barn and a 1920s kennel building and is a truly unique cottage. Postlip is beautifully situated in a hidden coombe on the leeward side of the Cotswolds' highest hill, yet is only minutes from Winchcombe, a classic Cotswold "wool town" with excellent shops and restaurants. Ideal for exploring the Cotswolds, Forest of Dean and Malvern Hills. 2 bedroom period country cottage and one spacious bedroom, contemporary barn conversion. Private gardens, off-road parking. Pubs and village store easy walking distance. Flexible start dates. 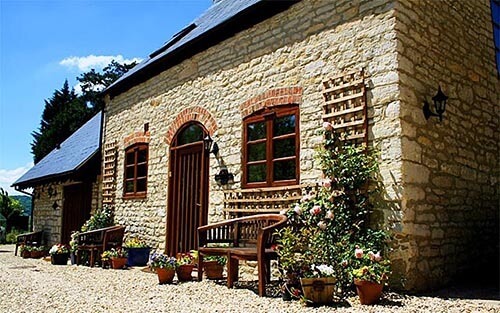 Old Manor Holiday Cottages in Twyning are on the western side of the Cotswolds in Gloucestershire. The area is a perfect base for visiting the Cotswolds, Malvern Hills, Forest of Dean, Gloucestershire, Hereford & Worcester. Both self-catering cottages provide year round accommodation for holiday rentals, short breaks and weekend breaks with flexible start dates - so you're not restricted to set arrival or departure days. Newly converted to a very high specification with wood burning stove for winter warming, also central heating throughout. Two bedrooms en-suite. Breath-taking views, excellent walks, 600m Cotswold Way, ideal touring base. Parking for two cars. Sheepscombe Byre is located three miles above Broadway, on the edge of the picturesque village of Snowshill. It is an excellent base from which to tour the Cotswolds, Oxford, and Stratford upon Avon. A luxury detached private cottage in the heart of medieval Tewkesbury, a stone's throw away from the ancient Norman Abbey and the rivers Severn and Avon. Ideally located for exploring the Cotswolds, Secure parking. Recently renovated and beautifully furnished. Stonemasons Cottage offers 2 bedrooms, 1 with a double and 1 with twin beds (this can be made in to a super king size bed). Both bedrooms have luxury en-suite bathrooms with rain showers, under floor heating and in one a deep bath. The cosy lounge with wood burning stove, flat screen TV and patio doors opens on to the secluded garden. The farmhouse style kitchen is fully equipped with fridge/freezer, fan oven & electric hob, dishwasher, microwave and washing machine. The adjoining sun room provides a relaxed seating area and access through the farm house style door to the private garden. Stylish barn conversion with a contemporary feel whist retaining beautiful elm beams and exposed stonework. Situated on a country lane it enjoys views north across Gloucestershire countryside to the Malvern Hills. A perfect year-round retreat where good walking abounds in the Cotswolds, Forest of Dean and Wye Valley areas. The pretty market towns of Ross-on-Wye and Ledbury can be visited, as well as historic Gloucester and Cheltenham with excellent shopping. The village shop is only a stroll of a mile away and the pub is even closer at about half a mile. A delightful stable conversion situated on a working farm. Garden with magnificent views set in beautiful countryside. Ideal centre for both walking and touring.